It’s been a while since I’ve shared a recipe on here, but it’s certainly time that I shared this one! 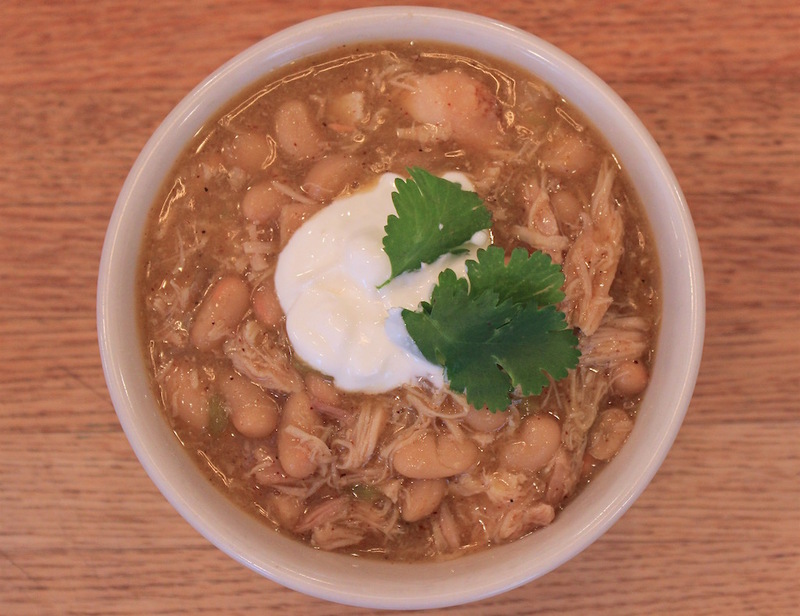 My family loooves this white chicken chili. It’s simple, delicious and full of flavor! I know that it’s finally warming up outside, but I love crock pot recipes just as much, if not more, during the spring/summer. The less time I need to spend inside the kitchen and the more time I can spend outside with my kids the better! Hope you enjoy as much as we do! 1. Place the chicken thighs, beans, chilies, onion, garlic, cumin, chili powder, pepper, salt, chicken broth, and coconut milk in a crock pot. Cook on high for 5-6 hours, or until chicken is very tender. 2. Remove the chicken and place in a bowl. Lightly shred with a fork. 3. Place the cornstarch in a small bowl and slowly whisk in the 1/2 C water to make a smooth, lump-free mixture. Stir the mixture into the chili in the crock pot. 4. Add the chicken back into the chili and stir to distribute. Let cook for another 30 minutes. Soup should thicken up. 5. Add the cilantro to the soup just before serving and check the seasonings, adding more salt or pepper if desired. If you want the soup to be a little thinner, add more chicken broth or coconut milk until desired consistency is achieved. 6. Top with a squeeze of lime juice.